The way my children sleep, leaves me feeling quite exhausted a lot of the time and so I often feel that exercise is a way I can regain some energy, often more energy than I would if I had a little nap (although, sometimes a nap is what the doctor orders)! Today, I chose to ride. 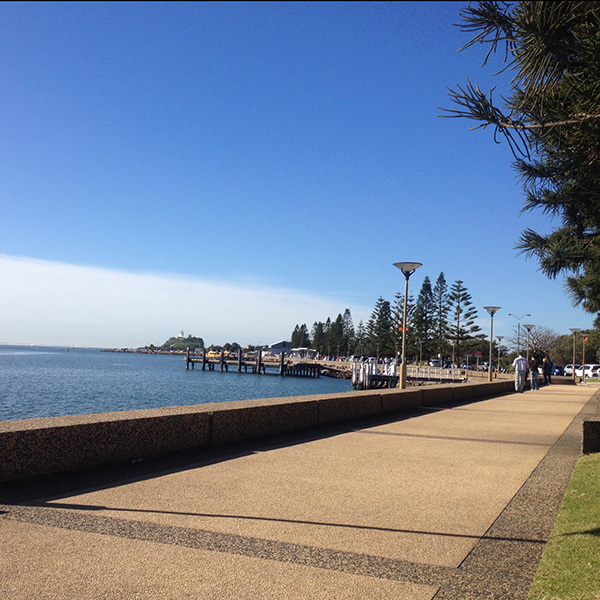 I rode my bike to the Newcastle Foreshore. Even though the air is cold today, the sun is warm. It wasn’t long before I was smiling a little and thinking how lucky I am to be a part of all “this”. I find at this time in my life I am often faced with the question of whether to sleep or get out and be active. I face it with my children – do I let them watch tv, or do I get in there and do some craft with them? I face it with my work – do I just settle for how things are at the moment, or do I continue to train and be better at my job? I face it within my community – do I volunteer to help out at the school, or pretend I didn’t see that notice? And every week I face it with my church, do I bother with the effort of getting my children ready to go to church on a Sunday or just sleep in? I must admit, the draw card of doing nothing seems to be so strong. Why? Why do I crave nothingness? I do believe that we all need “nothing” time to sit and listen to what thoughts, ideas and needs are coming up from within us. But as well as this, I also I know if I choose the “active” option I will feel re-energized in some way. It’s as if the act of connecting with my children, connecting with my working-self, connecting with my community, actually connects me to a greater life-energy source. For me, this greater life-energy source is “God”. This is where the core of my spirituality lies. It lies in “tapping in” to the people and things (expressions of “God”) that surround me. In experiencing love and appreciation of them, and being amongst them I actually experience love and appreciation of myself, and how I am a part of this amazing world. It seems apt to me that the winter sun made such a difference to my day today. The days are so short at the moment that I find the lack of sunshine in my life leaves me feeling drained and quite often, very down. But, in the midst of the winter, one sunny day, and just an hour of being out in it, can give me energy to keep pushing through more of that dark, cold winter. For me, THAT is the spirit at work. I actually wrote this song ‘Walk the Road with Me’ when I was young and naive to the difficulties of the world. Even then, I was pondering what God could be. I found that “blessing” and “expressions of God” could be found all around me when I looked, and that therefore, these expressions must look different for every person at every stage of their life.